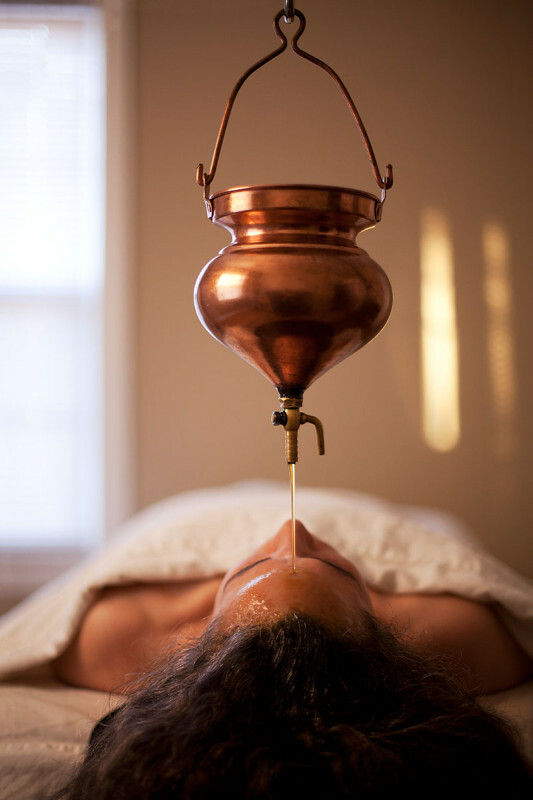 From the Sanskrit words “shiras” (head, which you might recognize from the Sanskrit for headstand “Sirsasana”) and “dhara” (flow), shirodhara is the gentle flow of warm oil from a brass oil fountain onto the third eye chakra (Ajna) just above and between the eyebrows. It’s an incredibly relaxing, meditative practice that stimulates circulation, brain function, and a healthy head of hair. Should you not be able to get to your local Ayurvedic practitioner, you can reap the health benefits of massage with Ayurvedic hair massage oils. Massaging increases blood flow to the treated area, and helps with fatigue, stress, and pain. This is also true for scalp massages, and they also benefit the skin, scalp, hair follicles and hair to grow faster and more luminous. Only oils appropriate for the hair should be used for scalp massage. We have Banyan Botanicals Healthy Hair Massage Oil for you to try this at home, but you can also use Almond or Castor oil to promote hair growth or Chamomile oil to soothe a flakey scalp. Start from your ends and work toward your scalp, and when you do, sweetly, strongly massage your scalp from the center to your hairline. Leave in for a few hours to penetrate (you can wrap it up and put it in a headband you don’t mind getting oily, or underneath a shower cap), or simply let it linger while you enjoy your shower and bath and conclude by washing your hair to remove excess oil.